Browse through LPF Pension and Financial information, Plan Booklets, and Member Newsletters. 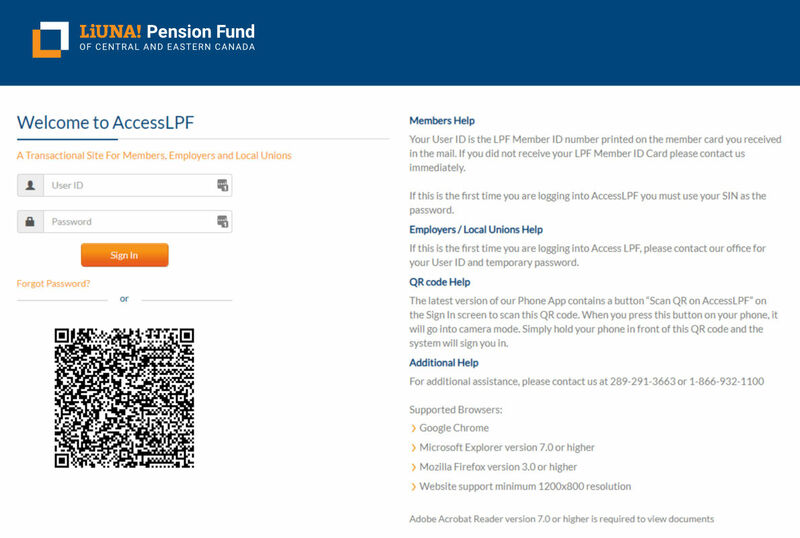 On the Home page click on the "AccessLPF" icon or any AccessLPF link available throughout the website. The first time you are logging into AccessLPF site you must use your SIN as your password. You will be prompted to create a new password immediately after logging in. Your new password must be between 8 and 20 characters long, include at least one letter and at least one digit or special character (ex: !,?,# etc.). Your password cannot contain your last name, first name or user name. Please remember that your saved password is case sensitive. If you forgot your password, you can retrieve it by clicking the “Forgot your password?” link. You will be asked to enter your User ID and the email address you previously provided to the LPF. You will receive an email with your current password. If you did not provide us with an email address, please contact us at 289-291-3663 or 1-866-932-1100 and we will reset your password to your SIN. You will then have to create a new password. The login screen also contains a QR code to use with your LPF mobile app to skip signing in with your user ID and password. The latest version of our Phone App contains a button “Scan QR on AccessLPF” on the Sign In screen to scan this QR code. When you press this button on your phone, it will go into camera mode. Simply hold your phone in front of this QR code and the system will sign you in.